It was tough and has required quite a bit of Linux kernel hacking and fooling around with our trusty LeCroy USB packet sniffer to get the bugs out, but it seems to be working flawlessly with Windows, Mac, and Linux hosts now. This means that you can now directly edit config files, install new machine vision modules, copy training data for your modules, etc to JeVois without ejecting the microSD card and while JeVois is running. There is no slowing down of the video even when you copy large files to microSD because the video stream is allocated a reserved bandwidth on the USB bus (isochronous). However, being able to switch through various vision modules while changing the contents of the microSD poses some potential data consistency issues, hence, for now, we have restricted this to only allowing file access while not streaming video. 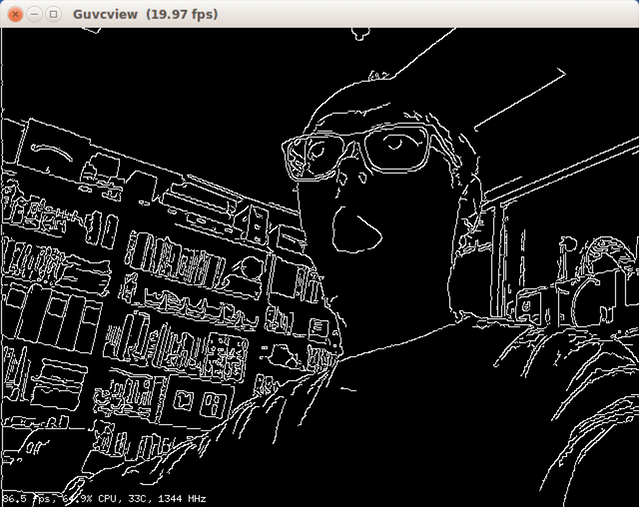 86.5fps at 640x480 on the JeVois camera and written in Python? Yes indeed! Taken together both of these improvements should facilitate rapid development and prototyping on JeVois: Edit a python module directly on the JeVois microSD exported to your host computer as a virtual flash drive, then just select the corresponding video resolution in your video grabbing software to see the results. 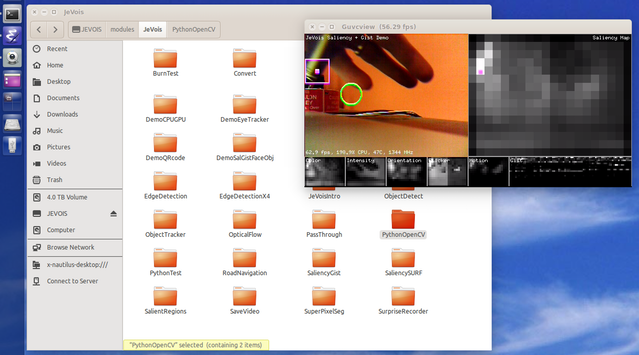 We expect this will allow many users to learn OpenCV with Python directly on JeVois. jevois-opencv: OpenCV 3.2.0 compiled for host computer with settings that match those used by the JeVois platform hardware. We install this package into /usr/share/jevois-opencv-3.2.0 so that it will not interfere with any other OpenCV install you might have on your host system and that might be required by some other software. As jevois-sdk-dev brings all the others as dependencies, getting up and running with JeVois development now just means one apt-get install command. Relocated many JeVois-related files (except boot and core) to the JEVOIS partition so they can be modified live by exporting the microSD over USB. with --microsd - install to /media/username/JEVOIS/ which could either be a mounted JeVois microSD, or a live JeVois camera exporting its microSD over USB. This should significantly facilitate the development cycle: no need to install/eject the microSD card anymore, just compile and install directly to it while it is in JeVois. New boot options BOOT:serialtty and BOOT:usbserialtty to give a Linux login prompt on the hardware serial or serial-over-USB ports instead of the JeVois console. Reorganized jevoisbase with a separate include directory to facilitate creation of debian packages.